Ambit Instruments is a leading supplier of Industrial Instrumentation, specialising in custom made products including Pressure Gauges, Flow Instruments, Temperature Instruments & Level Instruments. We can cover all your project needs, whether domestic or worldwide. In our Melbourne factory, Ambit Instruments manufactures to order our "Tec-Site" Rotor Level Indicators and customise pressure instruments for a wide range of industries, including Food and Chemical. 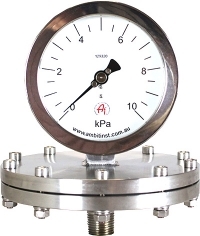 We also stock a wide range of standard pressure gauge and temperature indicators. Ambit can source made to order Pressure, Temperature, Level and Flow instruments where needed from our wide range of international suppliers.